I began my training in Shorinjiryu in November 2001. I was 48 years old at the time and in search of a way to get some exercise as well as lose weight. As a teenager, I had studied Judo for about 5 years. It was this taste of the martial arts that led me, after a chance meeting with then Shodan Jim Dee, to begin my training. At the time, Shodan Jim was kind of on “orphan” as he had been estranged from his teachers. A chance meeting with Kyoshi Lubitsch, at a Chinese martial arts show in NYC, afforded Shodan an opportunity to “return to the fold” as it were. The rest as they say is history. We became officially indoctrinated to the Kenryukan and the Shinseikai Dojo (Ridgefield Park, N.J. Dojo) has never looked back. We became frequent attendees at the Hombu and my training really began in earnest. As stated previously, I began training in late 2001 and was fortunate enough and honored to achieve my first degree black belt (Shodan) in November 2009. Many would take this as the fulfillment of their efforts, but in reality, it is the beginning of your training. This reality became more apparent as time passed. 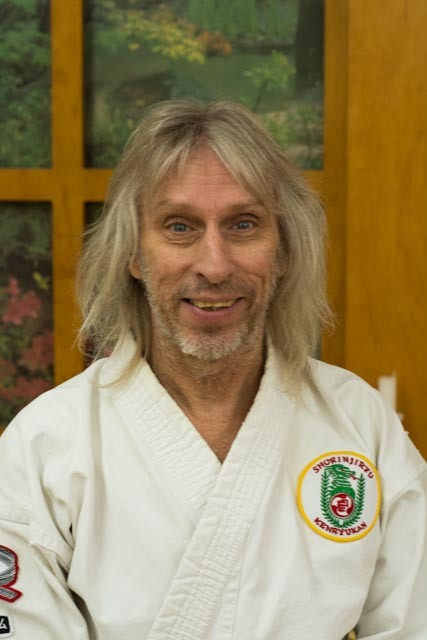 And, as this time did pass, I studied harder and in August 2102, was honored once again with my promotion to second degree black belt (Nidan). This paved the way for my instructors to allow me to handle classes on my own and begin to introduce my introspective, all that I had learned from my teachers over the years, to our students. This has had a very profound effect on my life. Our system is very intuitive style. For someone like myself, not a real big human being in stature, I do not wish to be standing in front of a large combatant and try to go toe to toe with them. The basis of Shorinjiryu is movement and counter attack. This is a very suitable form of martial art for me personally. I find that it has a multitude of elements of many other martial art types borrowing from kung-fu, judo, etc. As with most martial arts, it stresses the melding of the mind and body into a single entity, reacting without thinking, both calm and light as the battle develops. As I enter my 15th year of training, I am proud to mention that I have been recommended to test for my third degree black belt (Sandan). This would be a major accomplishment in the history of my life. Never in my wildest aspirations did I imagine that I would have progressed to this level. But, my personal take on this is, as with most of mentors, karate is a journey, not a destination. If you set off with a black belt as your goal, you may not observe the wonders and beauty of the trip! 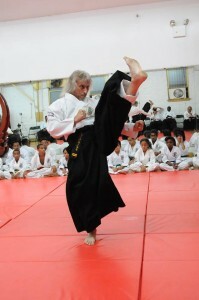 age should NOT be a deterrent to whether or not you study Shorinjiryu or any other martial art for that matter……..it will transform your life!